Chain Conversion Kit for 2006-Up DYNA with Chain -Harley Davidson Twin Cam. Our Conversion kit includes everything needed to covert your. DYNA belt drive to a heavy duty 530 O-ring chain This kit is for tires up to 180 width. 24T Front Sprocket and 51T Rear Sprocket is equivalent to the stock belt drive gearing. 49T Rear Sprocket= 4% Overdrive 48T= 6% Overdrive --------------- 55T= 10% Deeper 58T= 16% Deeper. 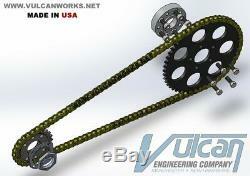 We have other sprockets and chain colors available from our website. NOTE: This is for OEM Style 6 Speed Transmissions ONLY. Will NOT fit your Revtech, Ultima, Baker or other Aftermarket 6 into 5 Speed Trans. Our 6 Speed Transmission Sprocket. 350 thickness for 530 Chain, beware of other thin. 25 thickness sprockets out there. Steel Sprockets last longer than aluminum sprockets and are ideal for high load situations (Burnouts, Wheelies, High Horsepower Engines). Black Powdercoat Steel or Chrome plated Steel. 48, 49, or 51 Tooth. Spacers have dual bolt patterns. One bolt pattern is drilled and counter-bored for 7/16 socket head cap screws, and the other for your stock pulley / sprocket bolts. High strength Grade 9 Socket head cap screws. Ultra Coated Grade'8' Hex Head Bolts for Rear Sprocket. 5 Grade'8' Hex Head Bolts. Five times as corrosion resistant as standard zinc-plated. 530 Series O-Ring Chain, 120 Link. Component designs optimized with computer analysis provides higher tensile strength. Specially controlled heat treatment means tougher material. Reinforced roller offers higher impact resistance and longer durability. Available in Natural, Black or Gold. More Sprocket Sizes and Complete Chain Conversion Kits Available here. _gsrx_vers_841 GS 7.0.16 (841). The item "Chain Conversion Kit for 2006-Up DYNA with Chain -Harley Davidson Twin Cam" is in sale since Monday, October 29, 2018. This item is in the category "eBay Motors\Parts & Accessories\Motorcycle Parts\Drivetrain & Transmission\Chains, Sprockets & Parts". The seller is "harley-parts" and is located in Manchester, New Hampshire. This item can be shipped worldwide.